Advekit Is One Of A Kind! LOS ANGELES—There is a stigma related to the issue of mental health in America. For many, acknowledging a mental health issue is seen as acknowledging that something is wrong with them. This socially constructed fear of being negatively judged is what has aided in the widespread avoidance of mental health treatment. For those looking for a therapist, it is no easy task, but the company, Advekit, is looking to change all of that. Advekit’s goal is to focus on de-stigmatizing issues related to mental health and attempting to match individuals with the right suited therapist to fit their needs. The company provides narrowed results (3 to be exact) for users to find the best suited professional to assist them. In addition, Advekit partners with businesses that align with the company’s goal of promoting mental health wellness. Canyon News had the pleasure of speaking to Alison Fussell and Arielle Garellek, the ladies behind the creation of this unique company. Fussell is a licensed Marriage and Family Therapist (LMFT) and Garellek has a background in education, previously having worked as a teacher and school principal. Advekit is an efficient alternative to a directory listing, where the company asks straight forward questions to make what could be an exhausting process simple, and provides a directory that is up to date. “Our goal in creating this platform is to provide an efficient alternative to the directory listing model of finding a therapist. Rather than putting stress on the individual to spend countless hours searching through profiles, we make it easy and straightforward – you receive three referrals of the best suited therapists to your needs,” said Fussell. Garellek added that it’s not easy to connect with someone who can help you and noted the difficulty of seeking professional help, as there is a stigma attached to those who suffer from mental issues. “We want to change that and make it easier to develop a good connection and working relationship with your therapist,” Garellek said. “When looking for a therapist, I was extremely exhausted after spending weeks searching for the right professional for me. In creating Advekit, I wanted to be part of meeting a need, not just with my personal experience, but from countless stories we’ve heard from others about the stress of finding a therapist,” Garellek informed Canyon News about her reasoning for founding Advekit. “As a mental health professional, it was alarming to me how often I overheard people talking about the difficulty in finding a therapist. This process should be effortless, so that more people feel encouraged to get the support that they need,” said Fussell about her founding of Advekit. While the company cannot guarantee a connection, they provide the best options they can to their users. People can run into dozens if not 100s of mental health professionals to choose from and it can be overwhelming and difficult, which can force some people to give up; finding a therapist is no easy task. 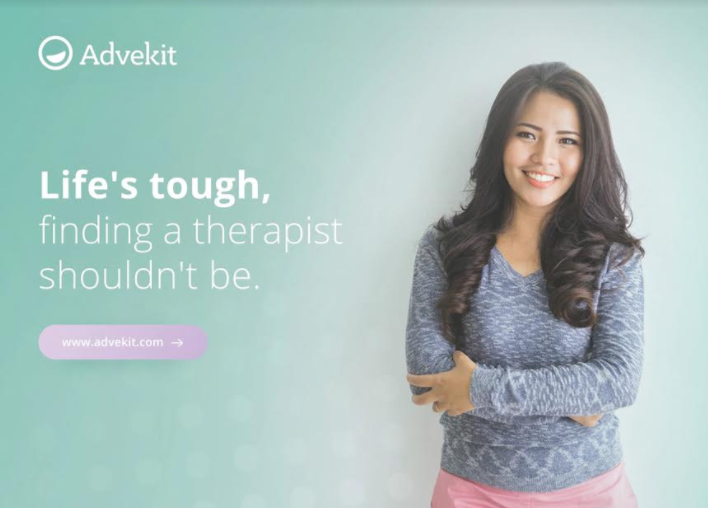 Advekit aims to vet each therapist, so that individuals feel comfort in the legitimacy of the therapists they are being matched with on the site: “We are trying to be extremely accurate with highlighting the strengths of our therapists, as to give people the best match possible,” Fussell said. A big concern for many when it comes to seeking a mental health professional is the cost and whether their insurance plan will cover treatment. Advekit founders noted that many therapists do offer a sliding fee scale, where payment arrangements can be made to accommodate the client’s income. Arielle indicated that getting people’s workplaces to note that they offer mental health benefits is important and not happening enough. She indicated that an alarming 81 percent of businesses don’t advocate for mental health services. Employees can take advantage of mental health benefits if they are made aware of them. “Our mission is to improve access and de-stigmatize mental health. Part of the de-stigmatization is making the process simple and stress free for every individual,” said Garellek. Advekit has a goal of serving as many communities and individuals as possible. They aim to make the conversation about mental health more public. They are currently only active in the Los Angeles area, but looking to expand rapidly in the coming months to ensure that people have access nationwide. “We are a modern and evolving platform that will continuously provide mental health resources as best we can,” said Fussell. For those who have questions please contact Advekit via email at support@advekit.com and visit their website at www.advekit.com. Previous articleLA Film Festival 2017!